PASADENA, California -- NASA scientists say that spacecraft orbiting Mars have returned clues of seasonal features on the Red Planet that could indicate possible liquid water. The features are dark, finger-like markings that advance down some Martian slopes when temperatures rise. The new clues include corresponding seasonal changes in iron minerals on the same slopes and a survey of ground temperatures and other traits at active sites. NASA believes that brines with an iron-mineral antifreeze may flow seasonally - but there are still other possible explanations. Researchers call these dark flows "recurring slope lineae" or "RSL." "We still don't have a smoking gun for existence of water in RSL, although we're not sure how this process would take place without water," said Lujendra Ojha, a graduate student at the Georgia Institute of Technology, Atlanta, and lead author of two new reports about these flows. 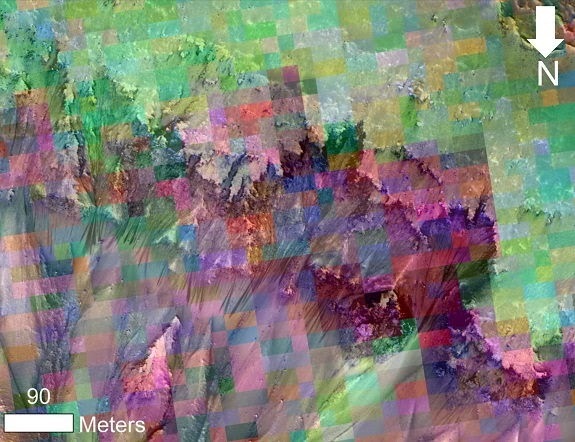 Ojha and Georgia Tech assistant professor James Wray looked at 13 confirmed RSL sites using images from the same orbiter's Compact Reconnaissance Imaging Spectrometer for Mars (CRISM) instrument. They searched for minerals that RSL might leave in their wake as a way of understanding the nature of these features: water-related or not?